AlgomaTrad presents Teilhard Frost in a house concert on Thursday, February 7, 7:30pm, in the Desbarats area. One reviewer describes Teilhard as “a natural born entertainer who’s stage presence is a joyful experience!” Limited seating is available, so please call 705 257 6106 to reserve your seat and arrange for payment. Admission is $20, students and children $10. A multi-instrumentalist and instrument maker, Teilhard Frost specializes in traditional Appalachian old time music. He was raised on Manitoulin Island, Ontario, spending time with the elder fiddlers in the area. At the age of three he was given a jaw harp and harmonica by his father, and his mother gave him a fiddle and a record of Kentucky fiddle tunes. He has continued to play them all ever since. 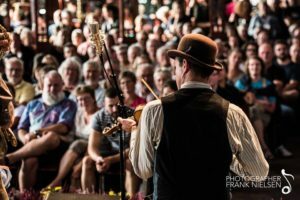 Teilhard also is an accomplished banjo player, singer, body percussionist, and clogger. He has spent the last twelve years touring with the critically acclaimed band Sheesham, Lotus and ‘Son, while developing his solo show. Teilhard has recently released his first solo recording, As the Crow Flies, available on his website HERE. Living on Wolfe Island, Ontario, Teilhard makes banjos, supper, and his bed.